We all know that Facebook is the ‘social’ networking site, and LinkedIn is the ‘business’ networking site. Facebook is pretty easy – when you get an invite from someone you don’t know, you ignore the invite. They’re probably scammers/spammers trying to get access to your friends list. But for business networking, it’s more difficult. I’ve met a lot of people over the years in business, and I don’t always remember them. Or, they’ve been referred to me by someone I do know. However, there are also a lot of time wasters on LinkedIn. People who send invites just to bump up their ‘reach’ for sending junk. And that’s where the LinkedIn invite system is broken. 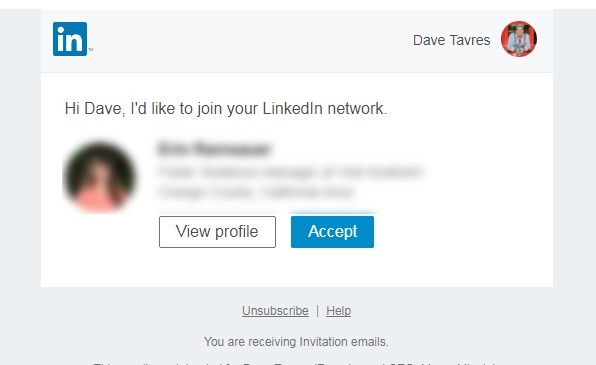 Right now, if you invite someone to connect on LinkedIn, the default message is "Hi Dave, I’d like to join your LinkedIn network." I RARELY accept those invites when I don’t personally know the person. Instead, those people should be WRITING SOMETHING in that box that tells me WHY they want to connect. They may have a very good reason for wanting to reach me. But if they don’t take the… 7 seconds… to write something in the text box before hitting ‘send’, I will assume they are time wasters. If LinkedIn would just clear that text box and require that the sender write something in there, it would make for MUCH better business connections, because people would have to say something. Sure, it might slow down the number of "connections" that people have, but that’s a good thing. Why? Because business networking is POINTLESS if you don’t actually know the people in your network! Multiple times I’ve tried to get introductions to people via LinkedIn for legitimate business reasons, by reaching out to someone I know (and am connected to on LI) – just to be told by my connection "Oh, I don’t actually know that person. They just sent me an invite and I accepted it." That’s where LinkedIn breaks down as a business tool. If I’m looking for a local auto mechanic and I ask my neighbor who worked on his car, he can give me the name and location of the shop and tell me if they did a good job. But if that same neighbor just says "Oh, here’s a random shop that I’ve seen on the drive home. ", that’s a useless, unqualified recommendation. Just like when people accept any invite that comes their way on LinkedIn. My LinkedIn profile is pretty clean. I’d bet that 98% of all my connections are people I personally know or have done business with. And even with that, I don’t usually connect with social friends on LinkedIn – only people I’ve worked with, done business with, or who I know what they do. So if you need an introduction from MY LI network, there’s a pretty good chance I can connect you in a meaningful way. I might even go so far as to suggest that people start pruning their LinkedIn network. Clean out the random connections and stick to business. If you can’t explain what someone does or how you know them, they probably are not a real business connection. Previous PostDo NOT buy a Matterport camera! Next PostPlease Just Say "I Don’t Know"